In the 878th millennium of human history, Imre Bergamasc awakens after 150,000 years to the realization that he has been the victim of an elaborate murder plot - one that has destroyed the intergalactic transport milieu known as the Continuum. But now that Imre has been reborn, he will stop at nothing to help bring forth the rebirth of the galaxy. BONUS AUDIO: Includes an exclusive introduction by author Sean Williams. Listen to more in the Astropolis trilogy. ©2007 Sean Williams (P)2008 Audible, Inc. It took a long time for this book to get going. The early parts were confusing and a bit disconnected. Once it got rolling, it was definitely more engaging. The idea of a resurrected character, male in a female body, with missing memories, is intriguing. But sometimes it was just tedious. I'd say that the characters could be better developed, and the sweeping mysteries could be less annoying. I enjoyed it, and will probably listen to more. I want to say upfront that I enjoyed this story overall. The technological concepts were very interesting, the plot was engaging, and the depiction of alternate modes of human existence was very provocative. That being said, there are some distracting flaws that really lowered my enjoyment of this story. First of all, while Mr. Williams made a good start on setting up this universe with technologies and alternative modes of human existence, he neglected to flesh it all out and explain it properly. It leaves the audience confused and bewildered at all the terms being thrown around. For example, how is a gestalt like the Jinc different from a Fort, which is also a group mind? How is it that Fort minds can span the entire galaxy when they can only communicate at the speed of light and there are only a few hundred "frags" altogether to cover that distance? How is Q-looping more desirable than other forms of communication for Forts? A lot of other details are glossed over as well, leaving only vague references for the imagination to work with. It makes a lot of the characters' motives and actions very hard to understand. And the character who speaks only in Gary Newman lyrics? That was a terrible idea! In the introduction, Mr. Williams said that he didn't want to reveal which character it was... but it becomes extremely obvious. Not to mention extremely annoying! Seriously, the guy drones on and on in nothing but reconstituted song lyrics... it adds nothing to the story except for the threat of a headache! If Mr. Williams was trying to be clever and profound, he failed. Because of these flaws, I took two stars off of my rating. But I still feel that this was a worthwhile buy for the reasons I mentioned earlier. I plan on buying the next book in the series and would recommend others listen to this book for themselves. I gave this one over 4 hours to try to capture my attention but I didn't like the characters, the story, or the narration. BTW, I love good sf and have read and listened to lots of it. This is a fine story of a time far in the future. The concepts of cloning and replicating characters allows the story teller to wipe out almost everyone and bring them back with a seperate fragment of the story. The only thing which didn't work for me was the decision to base the dialogue of one of the characters on the lyrics of Gary Numan, this leads to very contrived, enigmatic utterances and didn't do much for my enjoyment of the story. 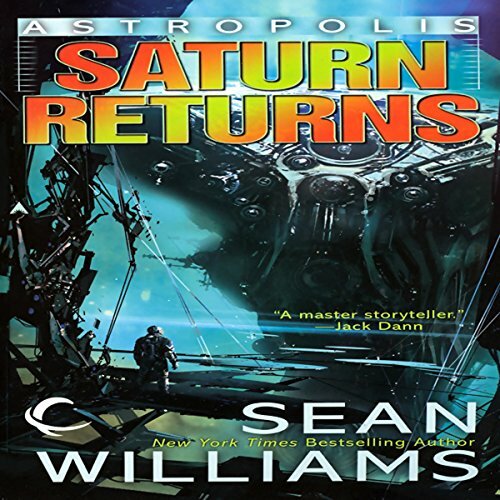 From its confusing and overwhelming introduction to its exciting finale, Saturn Returns is a thrilling and enthralling journey into the world of Astropolis and Imre Bergamasc. Filled with far-future sci-fi concepts, but following also some of the styles and devices of old-time gothic horror and Poe-esque thriller, you'll find it hard to put this one down. Williams does an exceptional job of creating not only believable and quickly familiar characters, but also of painting a world with such depth, such breathtaking scope, that listeners will have no problem being pulled into this incredible story, and Chistian Rummel, as a narrator, does an exceptional job of bringing the characters wholly to life. All in, by far one of the best, if not the best, series in my collection, and the story only gets better further into the series. All 4 books- more than worth the cost of getting them.